By Rashaan Ayesh , Paul Specht on Thursday, October 4th, 2018 at 12:15 p.m. The internet meme machine went into overdrive when sexual assault allegations were made against Supreme Court nominee Brett Kavanaugh. Dallas Woodhouse, director of the North Carolina Republican Party, tweeted that one of Kavanaugh’s accusers, Julie Swetnick, should be arrested, The News & Observer reported. Bloggers claimed to have photos of professor Christine Blasey Ford, the first woman to bring forward allegations against Kavanaugh, has been pictured George Soros, and that Ford’s lawyer was pictured with Hillary Clinton. 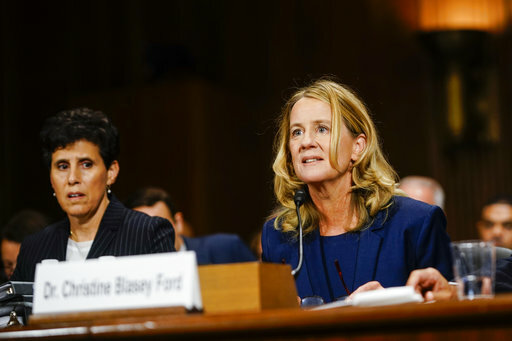 As PolitiFact shows, it’s not Ford in the photos. Now, Lanny Lancaster, Cabarrus County GOP chairman, has shared a photo allegedly of Ford, one of Kavanaugh’s accusers, that was originally posted on Facebook by an account under the name Joseph T. Mannarino. Lancaster shared the photo, which shows a young woman wearing braces and large glasses, adding the comment: "This is the alleged sexual assault victim. Wow." 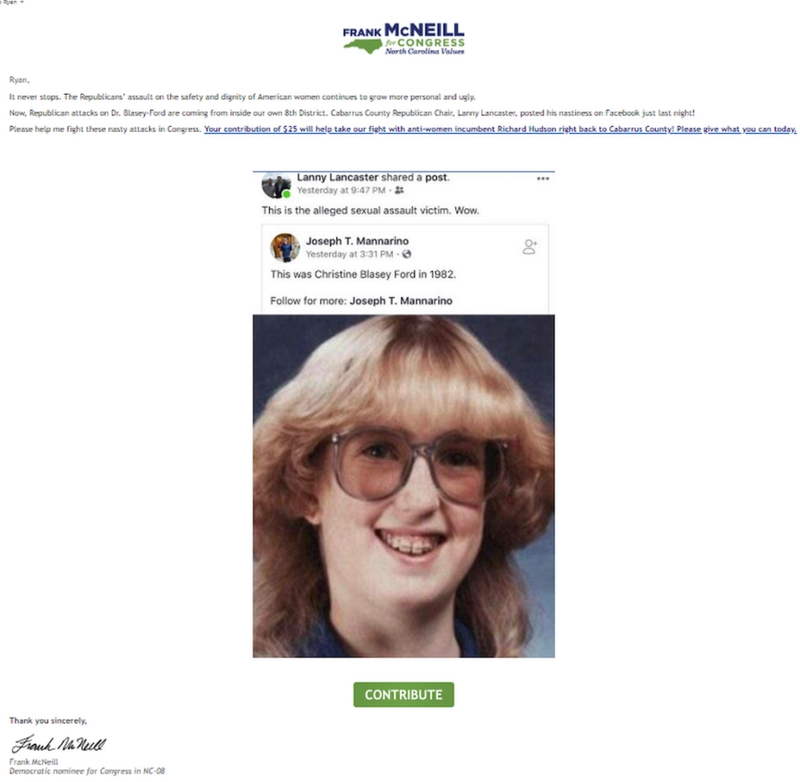 On Oct. 2, Democratic congressional candidate Frank McNeill included the post in an email newsletter as an example of a Republican "assault on the safety and dignity of American women." McNeill is running against Republican U.S. Rep. Richard Hudson in the 8th district, which runs from Fayetteville in southeastern North Carolina to the north Charlotte area. Mannarino’s post has been shared over 12,000 times, and has around 800 comments. Contacted by The News & Observer, Lancaster said in a phone interview that there’s nothing inappropriate about his post. "I didn’t say anything. I just said this is her picture. Basically, the media is distorting the facts on this lady. Everything she’s said is made up. She has no evidence whatsoever. I support that theory," Lancaster said. In addition, Lancaster shared why he shared the photo. "The media wants you to think she was a beautiful young lady who was on her way home from the tennis courts ... " Lancaster said. "I just wanted you to see the real person. I wanted people to see that this is really her." This caught our attention because several photos of Ford from her teenage years are circulating, and they don’t look like the one Lancaster shared. If there are different photos of Ford, then which is real? A member of Ford’s legal team confirmed the photo from Mannarino's post isn’t Ford. The image also appeared on Reddit, and has been used in lists focusing on bad yearbook photos or hairstyles, like this one. The photo shared by Lanny Lancaster is not Ford. Her legal team has confirmed that. In addition, the picture has appeared as early as six years prior to the allegation, and has since been circulating as a meme. 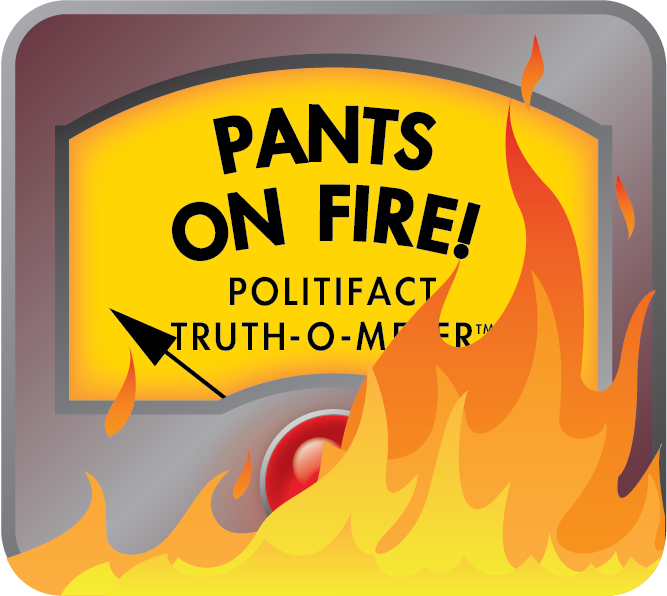 This story was produced by the North Carolina Fact-Checking Project, a partnership of McClatchy Carolinas, the Duke University Reporters’ Lab and PolitiFact. The NC Local News Lab Fund and the International Center for Journalists provide support for the project, which shares fact-checks with newsrooms statewide. Published: Thursday, October 4th, 2018 at 12:15 p.m.
Go social from aunty acid, "20 Cringeworthy 80s kids hairstyles that have to bee seen to be believed"